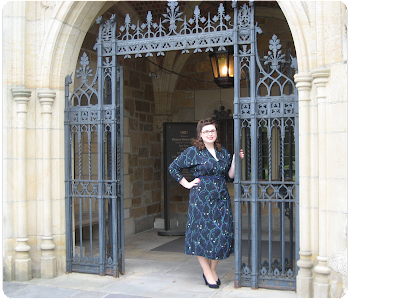 A week ago, my mom and I got a chance to visit America's Castle, aka the Meadow Brook Mansion. The mansion, or hall as it is normally referred to now, is located on Oakland University's campus and is the forth largest historic home museum in America. 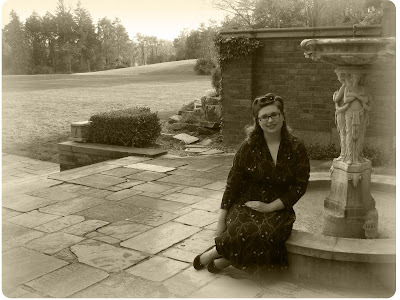 Matilda Wilson, the widow of John Dodge (yes, the man the created Dodge), and her new husband, Alfred Wilson built this 88,000 square foot home between 1926 and 1929. They modeled it after the Tutor style and made sure to have many specializations throughout the home. Each room was tailored to the occupant's tastes and interests. The home was also designed to have elaborate guest bedrooms for each of the occupants. This was a necessity when majority of the family's acquaintances resided in Detroit and would need to stay overnight for a visit. The 4 million dollar home boasts 24 fireplaces, 110 rooms, and 4 kitchens. 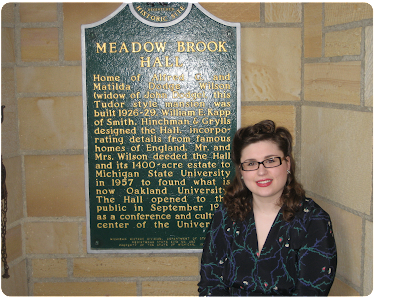 In 1957, Matilda donated the hall, land, family collections, and $2 million to Michigan State University to fund a college in Oakland County, which would later become Oakland University in 1963. In 1970, the University was granted autonomy. 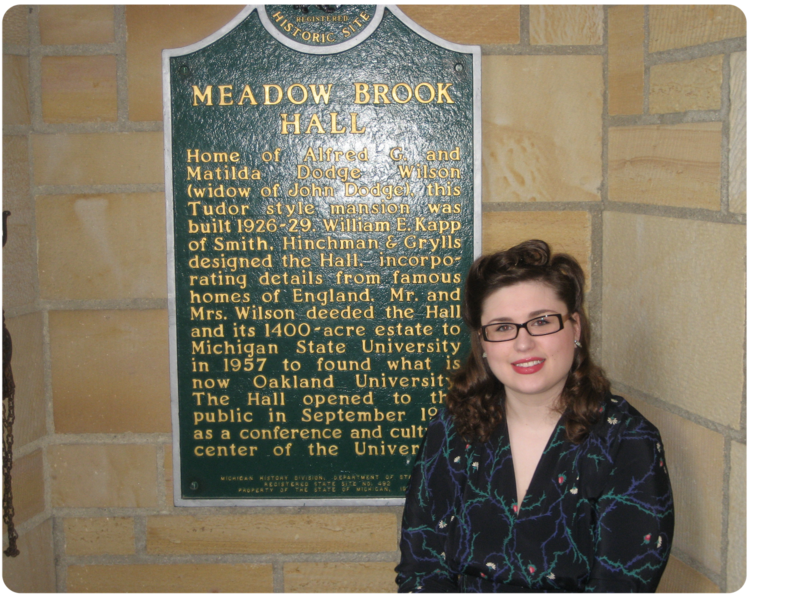 When I was looking around Michigan for potential colleges I might attend, Oakland was high on the list. I wanted to go to a school that was close to home, beautiful, and most important, a high standing academic establishment. 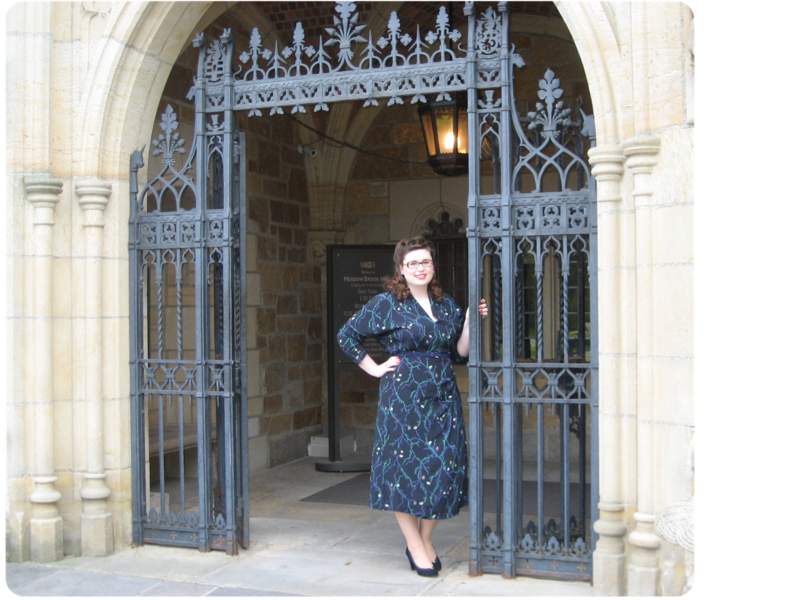 Throughout my four years at Oakland, I loved be surrounded by lush landscaping and the historic atmosphere. I also loved the smallness of the classroom sizes, which undoubtedly aided in a more hands on education, something Oakland prides itself in. Last Thursday, the English department was holding a reception and complementary tour for recent graduates. We were invited to bring a guest and enjoy some hors d'oeuvres while we celebrated our recent accomplishment. 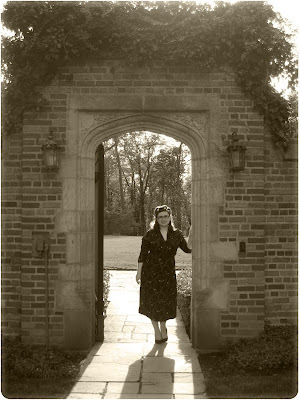 My mom and I thought it would be a great chance to take some vintage inspired photos on the grounds of the hall. I think they turned out pretty great!! :) I tried my hair in some victory rolls... they looked okay, but I definitely need more practice and any tips would be welcome. If you are ever going to be visiting the metro-Detroit area, Meadow Brook Hall should most definitely be on your tourist destination list!!! They also host weddings, for all you Michigan readers out there. If I ever get married, this is probably where I will be holding it at. How LOVELY! Your hair and dress are just gorgeous! I would love to visit that area someday! !